Judi Wagner's exuberance and excitement is evident in all her outstanding watercolors. Big colorful washes blend with a deft, impressionistic handling of details to create the mood of the subject. Be it a floral still life, a coastal marine scene or her love of architectural structures, her handling of this difficult watercolor medium is a joy to behold. Judi earned her B.F.A. and Masters degree from Parsons School of Design in NYC. In addition, she studied with well-known painters such as John Pike and Edgar Whitney. Her background includes Graphic Design, Theater Design and Printmaking. The artist's teaching experience ranges from classes in her own studio to Europe for Parsons School of Design and many workshops throughout the USA and abroad. Currently she has a full schedule, available on request. 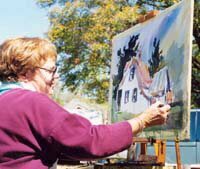 Judi's work has been exhibited in many national shows -- for example, the AWS, Audobon Artists, National Arts Club, Salamagundi Club, Mid West WC Soc., Louisiana WC Soc., Texas WC Soc., Montana WC Soc., Georgia WC Soc., Florida Keys WC Soc., North Dakota WC Soc., to name a few. Over the years, the artist has been the recipient of numerous awards, and was active in various Watercolor Societies. In 1998, a Judi Wagner Watercolor was added to the Bermuda Masterworks Collection. Judi's work has been featured in the following books: WATERCOLOUR IMPRESSIONISTS by Ron Ranson, SPLASH 2 AND 4 by Rachel Wolf, LEARN WATERCOLOR THE EDGAR WHITNEY WAY by Ron Ranson, as well as the two books she co-authored, THE WATERCOLOR FIXIT BOOK and PAINTING WITH THE WHITE OF YOUR PAPER, both published by Northern Light. Judi lost her battle with cancer October 19th 2010. She fought it for almost a year. Friends that attended services in Fernandina beach Florida used words like brave, true, and gifted to discribe her.